02:32 when the second breakdown comes in. 02:59 when the music comes to an halt. German born Mirko Zettl started producing trance and techno back in 1991 but his first own release came in 1994 under his alias Mirco De Govia with the EP Romantic EP. After the release, Mirco took some time off to study computer science On on the release, there is a remix by his good friend Ralph Kyau (from Kyau & Albert). When Ralph Kyau and Steven Moebius Albert started their record label, Euphonic in 1997, Mirco decided to start producing again. His first release on Euphonic came in 1998 with the track Firebird which was featured Euphonic Compilation – We Come In Peace. The first own single on Euphonic was Clubspring Meets Mindspring, a 2-track EP, both tracks are wellproduced tb303-monsters but I prefer Mindspring as it’s more in my taste. The second single, Epic Monolith (co-produced with Ronski Speed) follows the earlier singles recept with a major tb303-bassline and a complex buildup. The piano in the breakdown makes this an complete epic trancer. Epic Monolith was later signed to Alex Gold’s label, Xtravaganza. Things That Matter (co-produced by Ronski Speed) follows the earlier recipy and is a really epic trancer. Love the lead-instrument in the track. Mirco’s first album, Chronoscale came out in 2003 and contained 2 cd’s. The first CD contained original tracks and the second CD contained Mirco’s remixes of other artists tracks. The album was co-produced by Kyau & Albert and Ronski Speed. The featured track, Voller Sterne came out in 2004. It keeps that complex buildup from his previous tracks with a hypnotic bassline and warm pads.That breakdown is to die for. The album version is somewhat of a Chicane-ripoff with that balearic feeling and breakbeat drums. I prefer the Super8 Remix as its more driving but still keeps the warmth of Mirco’s original track. Asarja was another collaboration with Ronski Speed. They each made a version of the track. Mirco’s version has a strong buildup, a balearic breakdown with piano and still that complexity over it. Ronski’s version is abit harder, it still keeps that balearic feeling in the breakdown and even has wave-sounds in it. The 2008 album, Iconic Path was an all new album and contained loads of gems like Vital Spark and Evolution Part II along with 11 other well-produced tracks. All tracks were produced by himself and mastered by Rough Mullar a.k.a. Sonorous. The last release we saw from Mirco was the 2011 track, Sleeping Beauty. While the album version is somewhat of a chillout-track, the Ronski Speed-remix is a techy monster. Love the piano in the breakdown. Super8, Kyau & Albert, Sonorous, Sun Decade, Ralphie B & Lasgo with good success. Although Mirco hasn’t quit producing yet, many of my friends asked if he quit the business as there has been quite quiet from him. I hope Mirco will keep producing for a few more years as I believe he still has some tracks in him before he retires. His formula for producing still works, his tracks complexity is really awesome and the depth in his productions will still be modern for another decade. I love his use of the TB303-synth which was more frequent on his earlier releases. I hope to hear some new tracks from him soon. If not, his old productions will live on forever. 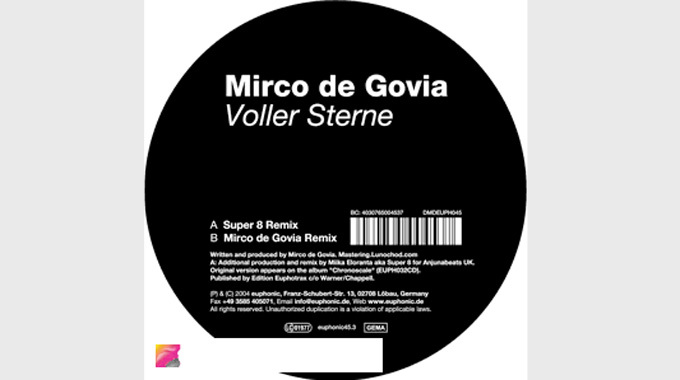 One Response to " Classic FTW: Mirco De Govia – Voller Sterne (Super 8 Remix) "